Tea Happiness- A blog on tea drinking, tea history, tea industry interviews, NYC tea experiences! : Tea History 101: What Is Smouch? Tea History 101: What Is Smouch? Dong Ding Oolong leaves- the real thing, not sloe! Steeping tea during its infancy in Europe and the American colonies was akin to living in the Wild West- no rules. Tea wasn't checked for quality, no one had a reference for proper preparation, and you couldn't be sure what was really in your tea blend. To add to the disarray, tea was in high-demand, and counterfeits were widely created. Sloe leaf as tea? Apparently it's inclusion in a tea blend was prevalent enough for the need to educate the public on how to detect it. Godey's Lady's Book was a popular women's magazine published in the mid-1800s, so it makes sense that the 'receipts' (word for recipes at the time) included information on tea. 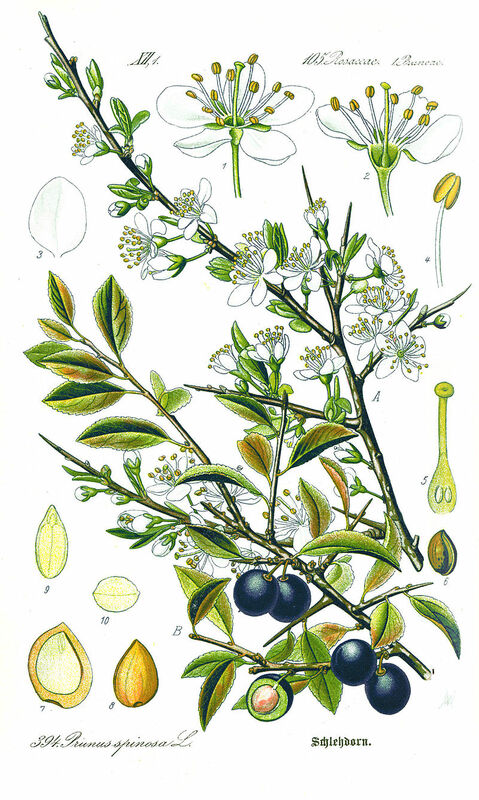 I'd heard about blackthorn (another name for sloe) tea as a medicinal herbal infusion, but this was the first I had read about passing it off as camellia sinensis leaves. In the 18th century tea was expensive and due to the tax on tea, smuggling was widespread. Another way to get tea without the tax was to recycle it and bulk it up. After a bit of research I found a fascinating blog post by Bruce Richardson on the use of 'recycled' tea leaves, including the use of sloe leaves. Not only were used tea leaves recycled, but it seems other offending material was added, creating a product with a strange name. The resulting product makes sloe leaves seem inoffensive in comparison. In case it's difficult to read the graphic, the top paragraph says: "Method of making Smouch with Ash Tree Leaves to mix with Black Teas. When gathered they are first dried in the sun then baked. They are next put on the floor and trod upon until the leaves are small, then lifted and steeped in copperas, with sheep’s dung, after which, being dried on the floor, they are fit for use. Another Mode. When the leaves are gathered they are boiled in a copper with copperas and sheeps dung; when the liquor is strained off, they are baked and trod upon, until the leaves are small, after which they are fit for use." Other accounts listed additional smouch ingredients such as spent and dried tea leaves, or leaves from entirely different plants; gypsum, clay, iron fillings, or sand to increase the weight; and Prussian blue, turmeric, soapstone or plumbago to improve the appearance. Consumers at the time knew green teas were commonly adulterated and therefore started purchasing more black tea. Interestingly, it is noted in The Social History of Tea that this could have been the catalyst for the British preference for black tea. ...As tea prices dropped, the 'adulterated articles'...were less in evidence by the 1870s and 1880s. By avoiding Chinese green and black teas and buying only black leaf from the British plantations in India and Ceylon, two things were ensured- a lower price and genuine tea. This Act of Parliment was helpful in halting smouch production, but not altogether. There were many attempts to stop the manufacture of smouch, but the thing that really put a stop to it is the Commutation Act, passed in 1784. The Commutation Act reduced the tax on tea from 119% to 12.5%. Also much later, in 1875 a Food and Drug Act allowed the adulterated teas to be sent back to China instead of being sold. Later still, tea merchant John Horniman came up with the idea to sell his tea in sealed packages, instead of in bulk. This eventually kept our tea smouch-free. It's crazy to think it took this long to somewhat regulate the ingredients in tea. I never realized researching sloe leaf tea would open up a whole world of sneaky tea concoctions! As you sip on your lovely cup of tea today, be thankful that it's only glorious camellia sinensis...at least, so we think. Thank you so much for this wonderful blog post. It is absolutely fascinating!!! Oh, and I also want to say that my family and I adore visiting Charleston, SC. We visit at least once a year. I must keep my eyes open in the gift shops for such interesting tidbits as the one you found in the Civil War Recipes book! Thanks so much Lynn! Glad you enjoyed it. I think I found the book in the gift shop at Fort Moultrie. But I'm sure it's in others around the area!